At Burns Family Dentistry, one of our goals is to help raise awareness about breast cancer and try to do our part to help. 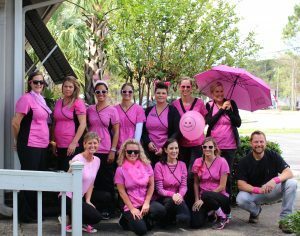 For several years now, we have taken a staff picture (with our best pink fanfare), posted information on our Social Media outlets, and made a donation to the Pretty in Pink Foundation. Pretty In Pink Foundation’s mission is to provide uninsured and under-insured breast cancer patients in North Carolina with financial assistance for quality, life-saving medical treatment. They make this happen with financial commitments through sponsorship, fundraising, donations and pledge drives that support our Champions throughout North Carolina. When breast cancer is present and medical insurance is not enough, care can be delayed or simply not ever received because of cost barriers. Once diagnosed with breast cancer, often times individuals are choosing between breast cancer treatment and quality of life needs like shelter and food. The process of managing breast cancer treatment includes the careful coordination of medical professionals, surgeons, hospitals, oncologists and radiation oncologists. Once diagnosed, people with breast cancer are immediately thrust into a process unlike anything they have ever experienced. To make managing breast cancer a little easier, Pretty In Pink Foundation helps ensure that quality, life-saving medical treatment (surgery, chemotherapy and radiation therapy) is available to breast cancer patients residing in North Carolina. If you want to join us in raising awareness, share our Blog or Facebook post with others or if you want to make a contribution/obtain more information, visit Pretty in Pink Foundation. Check out Burns Family Dentistry for more information about our staff and services – be proactive, stay healthy and take care 🙂 see you soon!